Q. You co-wrote four songs on this new album. Does songwriting come naturally to you these days? A. It’s been a hard few years. I was quite ill for a while, then I got writer’s block, and out of bad things come some great things. I was going through such a hard time personally, and I couldn’t write; I never can in the middle of it all. So I made that beautiful record of covers — I hate the word “covers,’’ but anyway — called “Easy Come, Easy Go’’ [from 2008]. That gave me breathing time to heal in many different ways, and it did incredibly well. Q. At this point could you make a sunny pop album, or do we expect a Marianne Faithfull record to be dark and full of pathos? A. No, I don’t think so. “Horses and High Heels’’ is a happy record, but my fans would be disappointed if it was just a great big apple pie at the end of it, wouldn’t they? I never know what I’m going to do next. I don’t know how many years I’ve got left, but I’m thinking a great blues record would be good. Q. From PJ Harvey to Beck to Cat Power, you’ve always kept good company on your records, particularly on more recent ones. What is it about your story or your mythology that appeals to younger musicians? A. I don’t know. We all kind of go together, don’t we? I really can’t explain it. It’s like poor little Frances Bean [the only child of Kurt Cobain and Courtney Love] calls me her bohemian grandmother when she wants Courtney to back off. She said, “I’m going to stay with my bohemian grandmother Marianne.’’ And I’m that: I am the bohemian grandmother. Q. A lot of attention has been paid to how your voice has evolved over the years, from pristine innocence to damaged beauty. What do you now hear in your early recordings from the ’60s? Q. You don’t perform many songs from those early days anymore, do you? A. I don’t, darling. I haven’t got the voice anymore. One of the most interesting things about that early part of my career was that I was singing songs that were actually too old for me. To sing them now would be to make a big mistake. So really, let’s leave them as little bits of perfection. Q. When you think back on the range of music you’ve made — pop, rock, country, jazz, cabaret — what do you think holds it all together? A. My journey. Me and you, hand in hand, going forward into this journey. That’s it. Commercial concerns have not been my priority, unfortunately. (Laughs.) I really wish I had made much more money, because I can’t go on forever. And I don’t want to be poor and old. 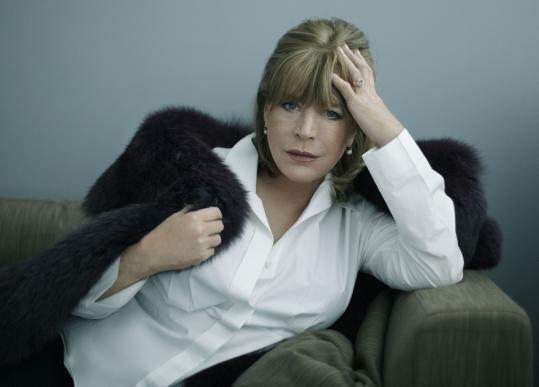 I want you all to pretend you’re little vampires and go out and bite people and turn them into Marianne Faithfull fans. Do you think you could do that for me? Please. Think of my old age. Q. You spent a few years in the Boston area in the ’80s. What do you remember from that time? A. Cambridge was where I went to recover. I left Hazelden [an addiction treatment center] and went to live in Boston. That’s where I first went to meetings, where I went to therapy, where I was at my most open. That was the most wonderful feeling, and I have great memories of all the people I knew who were all so kind to me and literally saved my life. And I also managed to go to the Harvard Extension School and studied Shakespeare. I mean, that’s what I call real life. Do it all. Interview was condensed and edited. James Reed can be reached at jreed@globe.com. From pop-star ing�nue in swinging ’60s London to homeless drug addict a few years later, Faithfull has weathered the tumultuous times she has chronicled in a career spanning nearly five decades. At 64, she’s seen as the ultimate survivor, an icon with a ravaged voice that tells you she’s been to hell and back. Faithfull recently put out a new album, “Horses and High Heels,’’ which was produced by longtime collaborator Hal Willner. It will be released in the United States on Tuesday.